OoC)) Skip, Felix remains absolutely still and is covered with the blanket keeping his cough suppressed as much as he could. The mud was yielding, Uxie could feel it. The flow remained constant but was slowing considerably already; it would not be long before they could continue safely. However, while a calm was coming over the force of nature one of his companions felt naught but distress. "We're screwed," was the start to an exorbitant display. "What are we supposed to do?!" Could she not sense the receding danger? With a more appropriate calm R'hia hushed the child, letting logic flow through her words. "Besides, Uxie has the best sense of us all, we should try and take what he says into our plans. Who knows, maybe this was our way in without being easily noticed?" Floating down closer to the mud the Legend was curious of any plans the human had thought along that idea as he had thought of only one 'clean' plan. Angling his head toward the fire escape that the Aiveon clung to he paused before speaking. "It is unlikely the other Pokemon will approach the mud until they consider it safe. Precautions would have been taken long ago to keep their supplies safe, and if there is a watch that would be enough to ensure they work properly." With a bob and weave he 'gestured' to the surrounding alley. These buildings had been designed to withstand such weather and events, so while tedious to clear mud would be no real hazard once still. Moving closer to the fire escape the pixie doubted that was its actual intended use here despite its known name. "Our destination has nearly been brought to us by this event. It is two buildings over, and traversing the rooftops would prove quicker than slogging through rivers of muck." Seek's wide eyes were filled with massive pupils, but even as they narrowed at R'hia's words the bug-eyed look did not dissipate. "We stop getting any louder than we need to, first of all. Who knows who heard anything at all? Like Uxie said, mudslides are common enough, do you really think they'll be overly curious of this?" Digging her claws through the holes in the metal grate Seek bared her fangs at the human. YES. How would any creature get used to this? How would anyone get to a point where this was normal? Giving her wings a hard flap the Aiveon flicked as much water and mud off them in one motion. Had the human not just condemned her voice she would have given her a piece of her mind. Boy, it was getting harder and harder to old back..
"Fine," she hissed through gritted teeth as R'hia continued. Tucking her wings back in the newly evolved flying type worried just how much this mud would effect her. It was heavier than she remembered, and flying seemed to be completely out of the question now. Pushing that worry away Seek resisted the urge to groan as Uxie spoke. "Our destination has nearly been brought to us by this event. It is two buildings over, and traversing the rooftops would prove quicker than slogging through rivers of muck." Turning her head sharply the Nebula Pokemon narrowed her eyes suspiciously. She had already ruled this path out yet the legend thought it best? Was he a fool, or was she missing something blatantly obvious? Objection hung on her tongue, but before it could come out there were two sounds. Eleroo squatted, wiggling his hindquarters before jumping bravely to the fire escape and causing a deep thunk from the dumpster. The second came from his torso and paws giving a wet thud on the metal grates upon landing. With a single pant he scrabbled to his paws and quickly scurried up the first flight of steps to make sure R'hia had room. "Could they see us up there?" He asked nervously, eyes staring out toward the city. "We'll be sitting targets.." With a heavy groan Seek acquiesced and started up the steps as well. She gave him a rough nudge and forced his paws back into motion. "Just stay low." She said so simply, but the words only comforted him slightly, as though they had been held back. Glancing anxiously at R'hia and Uxie as he walked the Radeon shuddered at the thought of being spotted. "What about noise?" He asked, his sodden fur prickling. Just his claws clicking on the metal was enough to make him panic. Once they were on top, no, on the Mart itself, what was stopping the others from hearing them? "They'll hear us inside for sure." Giving an audible swallow Eleroo almost chocked on his saliva. He should have never come on this mission.. "You really think they could discern steps from the pounding of rain?" Seek scoffed back at him. Her confidence seemed to be returning, or at least a facade of it as she jumped over him to take the lead. "You worry too much." Shenron lowered himself back down on his stomach and slowed his breathing. Right. Stay still. He just watched and listened. They'd move on if there was nothing to steal right? It made sense! Shenron looked at Felix from the corner of his eye readying his hand to cover the kit if he started coughing again. He could feel some tense-ness in the air and it greatly unsettled him. Like that deep breath before you jumped into the water. You knew it was going to be uncomfortable and the discomfort wasn't going to go away for a bit. Nonethless he had a rude burning hot awakening ready if it went that way. R’hia measures her own expressions carefully as the sees Seek’s face contort into a rather spiteful look. Now Asura’s words about her are making sense… in the heat of the moment, her lack of experience shows less than her youth and emotion. But still she holds herself together- if nothing else, she knew it best to not make a scene, or at least a noisy one, right now. She uses her uninjured hand to hoist herself a bit, following Eleroo up as seek rather hypocritally chides him for having worries. Something she notes, but doesn’t actively call it out for the time being. The Sylveon kept as quiet as he could as his coughs sometimes tries to come out hard, but he continues to suppress it as much as he can to keep whoever or whatever it is outside from hearing him. Then the voice then walked off giving a sigh of relief as he uncovers his head. "That *cough* was a close one." If anything was to come then something bad could of happened. Luck was on their side this time, but he still had to take it easy until the others got back. For now he just laid there just coughing and remembering what it was like before all this happened. "I wondered what this place *cough* was like before all this happened, I remember back home *cough* things was just nice, but now.... Its a nightmare." He had hoped one day that everything will become like it was before. Zigzagging across the fire escape Uxie watched his terrestrial companions ascend with haste. While the pair moved evenly with little difficultly the Legend found it prudent to watch the biped as a sort of precaution. She did not seem to be in a position to fall, but if she did slip catching herself could be an issue. "Could they see us up there? We'll be sitting targets.." the Radeon fretted, his paws visibly shaking, and not from chill. "What about noise?" They'll hear us inside for sure." Both questions were valid and held merit for further discussion, but the Aiveon was less enthused about such dangers than her kin. "You really think they could discern steps from the pounding of rain? You worry too much." Such dismissal would be foolish if no for the kit's exceedingly light steps. Hollow bones and weightless fur made for silent movements, but that did not speak the same for their companions. From his relatively close position Uxie could hear each thud of Eleroo's paws and R'hea's shoes. They were soft, but enough to made a noise if one listened. And the question of who was listening was something of interest. ”Uxie, is there anyone inside the buildings? Living or dead?” Moving vertically past another set of steps the legend extended his telekinetic powers into the building and those beyond. The mental image he received would be a muddled mess to those not adept, and discerning different objects and the pulse of life was effortless after so many centuries of practice. Continuing to rise higher the legend gave a long pause before any response. "There are several presences between these buildings." Most were thoroughly dead, though he failed to mention them as they were non-consequential. "None of note in this first building." Twisting inside and out the metal supports in a small twirl the pixie arrived at the top of the building and saw a clearly abandoned rooftop. "However, something erratic about the next leads me to assume we have undead company nearby." The mud was still roaring down below them, but as Eleroo peered over the edge he could see that the flow had slowed considerably. The mud was flattening out, branches moving slower as the momentum was lost in the viscous fluid. It was still too dangerous for them to attempt wading through, but at least the worst of it was over now. If they fell at least they wouldn't be swept away, right? Pulling his head away from the edge Eleroo truly felt the panic starting ebb, and as the adrenaline went with it he realized once again just how cold it was. His thin fur was no match for the rain, and now with a slathering of mud on top of it he was shaking like a leaf. Taking in a deep breath he shook out his fur, and heard an annoyed hiss from Seek as he splattered her with his refuse. Cringing, the Radeon lowered his head in apology, and continued on with his thoughts starting to wander. Without that panic and fear he just couldn't stay focused, no matter how precarious and cautious he needed to be. When we get back Shenron will have a nice fire for us.. They could rest and warm up by his flame while listening to Seek recount their adventure. A stiff breeze hit the kit in the face, and as he squinted he could only hope that happened sooner rather than later. Seek climbed briskly, ready to hit the roof and get out of this alley. ”Uxie, is there anyone inside the buildings? Living or dead?” R'hia asked, though she didn't sound nearly as quivering as Eleroo did. Why were they both so worried? Height gave them the advantage, they could see anyone coming! Rolling her eyes the Aiveon leaped to the next step and could nearly see the rooftop as Uxie answered. "There are several presences between these buildings." Great, that wasn't vague. Totally helpful. "None of note in this first building. However, something erratic about the next leads me to assume we have undead company nearby." Stopping her paws for a few seconds Seek looked toward the legend as she tried to decipher his words. This buildings clean.. theirs undead in the next. What about the last? You know, the important one? Maybe it was empty too, since he didn't say anything. "Neat." She breathed while reaching the top of the fire escape. "Then we can cross this one with no issue and hurry off the next." The Pokemon were inside right? So if they were fast then there was nothing to worry about. Planting her feet firmly on the rooftop the Aiveon hoisted herself up and stood proudly for several moments. She could hear Eleroo's paws fast behind her and stepped forward to make room before lowering her stance carefully. "See? Nothing to worry about." She spoke with a whimsical air, but let her eyes slide across the roof as she did so. It appeared empty, and with careful steps forward she primed her ears for anything out of place. Her ego inflated ever more as all she heard was the beading, pounding, bouncing sounds of the rain splattering against the rooftop. No one could hear us through that. Reassured, the flying type beamed and took confident steps across the building. Eleroo felt none of her confidence. His belly was low, the muddy hairs dragging lightly against the tar roofing as he watched Seek bounce closer to the edge. She must have had some sense as she hid behind the projecting structure that had the doorway while she looked out at the town, but he still wasn't comfortable with it. "I don't see anyone. Guess they all went running when the mud came." Frowning, Eleroo ignored that thought and made a b-line for the far edge. The gap between it and the next building had been a moot point in his mind until now, and he watched as it grew with each step he took. Anxiety began bubbling in his belly like pop rocks. "Are.. are we going to have to jump?" He asked hesitantly while looking over the edge. It wasn't that far, but it was still a frightening jump. Shenron exhaled as the voice retreated and crossed his front paws struggling to relax. "This place was reminiscent of my home in Fuschia... The Marsh held promising Pokemon for young trainers. Being a gem on the commerce necklace meant this place was well-traveled" Of course the most well-traveled had been struck the hardest... Trainers trying to hide out with their precious partners. Not knowing what to do when they became sick. Falling... Dying... All under the hands of partners who swore to protect them. Shenron couldn't begin to imagine the terror and confusion. Calling out to the Pokemon trying to stop them. The reality setting in too late. His paws kneaded at the floor calming him down after a bit. I remember Kanto before as well... I knew the region like the back of my paw. I'm not sure what its like now..." Sometimes he considered flying home and seeing what became of the ranch he was born on. Where he met Baloo. Wander those long worn paths through forests and caves. Smile remembering every encounter gifting him a new friend. Of course every region brought friends but you never forgot your first. "Where is your home? Is it somewhere far from this place?" Listening to the conversation in the background, he could hardly let himself drop his guard yet. It's likely just nerves, but whatever or whoever had come and gone was a stark reminder of their situation. He stays standing, eyes glancing towards the door now and again as the two discuss their time in the age prior, before hell had clawed up to the world. Passing thoughts of his old Master rose in his mind, a bittersweet smile playing over his expression. The girl's confidence was somewhat reassuring though. With the human still behind the others, the lack of any exclamations or questions of who else might be on the roof was a good start. She hoists herself up one flight at a time before finally making it atop with the others, groaning a bit as she looks at her bandaging. Soaked, almost a moot point to have bandaged it save for applying pressure. Blood had already soaked through, though it wasn't an obscene amount fortunately. It did, however, mean any attempts to sneak by undead may be made more difficult. She approached the others hunching to keep a little lower profile as she came to the edge between buildings. "Are.. are we going to have to jump?" Guess alleys look a lot narrower from the bottom looking up... the Radeon's concern wasn't misplaced, R'hia shared it. Hell, she felt like she might have the worst time making the jump, between the wet floor and just not being built for speed like they could be... Much as she tries, she finds her thoughts lacking any ideas outside of the jump. OoC)) Skip, I might come back to this Sunday if time allows. "Neat." Seek near insulted his perception as she strut onto the rooftop without a hint of hesitation. Arrogant child. She was not harming their quest at this point, but need he reprimand her behavior again he would not hesitate. Alas, for now, the party ventured onto the roof cautiously and made their way to the other side. "Are.. are we going to have to jump?" Eleroo asked, clearly frightened by the prospect as his companion agreed, "I'm not spotting many other options..."
For a being who's main mode of travel is levitation such a thought was irrelevant and easily forgotten. With a running start the Radeon could probably clear the roof, though just barely. Between mud and weight however the others would struggle and risk a devastating fall. "Uxie, you said it was this building that was clear, right? Maybe we can find something to make a bridge inside?" A sky bridge? How very human. "Perhaps," the legend mused the idea of their venture veering into that of an exploration. "This building is clear, but for the sake of time I would offer to lift everyone across this alley." Again, such a thing was beneath him, but they had wasted enough time already. Placing her paws firmly but carefully on the edge of the roof Seek sized up the gap between them and the next building. It was enough to make her sodden pelt twinge with apprehension. "I'm not spotting many other options..." R'hea said as she looked for any other path. Was this the only way then? Standing up straight Seek spread her wings out. I could make it. She thought, but as her wingspan unfurled completely the Aiveon could feel the weight of the mud across her pelt. If I wasn't a filthy mess. Flicking and shaking her pelt the flyer tried to removed the excess grip, and while many chunks went flying the persistent weight remained. Casting a sideways glance back over the ledge Seek's lips buckled. I'm no better than them right now. Narrowing her eyes an exasperated sigh wheezed from her maw. Peachy. Padding away from it the flying type started trotting around the parameter, grumbling. The fire ladder was only on one side of each building. Really? How was that useful? Humans are dumb. The knot in Eleroo 's stomach only tightened. New patches of mud dotted his pelt thanks to Seek, but he could barely feel it compared to the clenching of his insides. Thankfully, R'hea wasn't about to make a mountain out of a molehill. "Uxie, you said it was this building that was clear, right? Maybe we can find something to make a bridge inside?" A bridge? The child popped up in an instant, spirits lightened. That could work, and they might be able to drag it across to the other side too. His tail wagged, excited by the prospect and innovation their companion offered when Uxie responded. "This building is clear, but for the sake of time I would offer to lift everyone across this alley." His red eyes glistened, staring widely at the legend. Oh, I guess that's simpler. It would definitely be safer, possibly safer, but he couldn't help but feel a lump of disappointment tickle his stomach knots. "A lift for this one?" Seeked barked back at him, the snide words somewhere between a question and a mockery. She stamped her way back to the ledge and stood firmly before it. Unless the guy planned for them to jump the next one she didn't understand what he meant. That, and she didn't really care. "Then by all means, let's go." Eleroo moved up next to her, body low to the ground with concern in his gaze. Again, Seek didn't understand, but the sooner they got there, the better. That was all that mattered. "Where is your home? Is it somewhere far from this place?" Shenron asked Felix on where he was from and he honestly never been asked that by anyone. Guess it couldn't hurt to tell him since he had nothing else to do. "My home? Its actually *coughs* outside of a big city in Kalos where the lights *coughs* always shine in the night and the tower is alit. It isn't anything like *coughs* the other regions, but it was home." From what Felix was feeling, maybe if he explained some things that led him to wanting to help pokemon out from their stress and other behaviors, then it would help them understand his mind. Though as stubborn as Seek was when they first met, it would be hard to explain to her. Then it brought up the next thought on his mind if she's going to be okay out there getting the medicine for him. "Its strange. I never *cough* pictured myself to *cough* be a psychologist if that's what humans call it. Times did change for me *cough* from my battling days." The Sylveon said. There was one thought though that he wanted to ask Asura. Where did he come from? Guess it wouldn't hurt to ask. "Asura, where did you come from? You seem *cough* to look like a champion of some sort. I know you told me something *cough* before, but since we're here alone, *cough* why not just keep the air lively." The eeveelution asked as he took some drinks of water. The blanket keeping him warm and comfortable as he talked with the charizard and the Machamp. Felix never had much of a family other than his trainer and the pokemon with him. There was things that he even wanted to ask Uxie if there was a chance he'll run into his trainer or someone that can take him to his trainer. The answer might not be what he likes though. "Do you guys think that *cough* there might be a chance to *coughs* see the end of this horror?" In honest opinion he felt that there was still a ray of hope, but even if they did end it they'll have a long time to rebuild as Uxie said. "Then by all means, let's go." With acknowledgement that he would not frighten the party Uxie centered himself behind them all. As he focused his arms and tails stiffened, his body rendering his strength active and visible as soft glows coated the non-psychic Pokemon. With the switch flipped his body relaxed, the power just part of who he is and completely capable of such a simple yet complicated act without any needed effort. Lifting his companions Uxie moved forward with them at the same pace. The alley beneath them was a moot point, simple a marker of the distance they were moving in the few seconds they were airborne. Before Seek could throw another complaint out the action was over, and all feet and been placed down safely on the next rooftop as the glow faded. But his power did not. His sensitive perception could not ignore the creeping, moving, scratching sensation that was moving down below them. It had moved up and was on the highest floor of its own accord. Perhaps he should have moved them to the best roof, or simple their destination afterall, but that was hindsight bias. The others had already started moving, making rhythmic vibrations on the roof's surface that could not be erased even if he picked them up once more. "There is company within." He warned, the sound of its creep steps as it made its way toward the stairwell enough to make his skin crawl. Eleroo cringed, his body feeling like pins and needles as the psychic energy coated his purple fur. It wasn't painful or even that unpleasant, but something within his pelt or his brain was screaming this was wrong. His paws twinged, curling his toes inward before flexing them erratically. His legs twitched awkwardly, a stiffness to their motion as he dangled over the alley with wide, stressed eyes. Flicking his gaze over he could see Seek was having none of the issues he was. Was he just stupid, or broken? The jabbing, tingling sensation was overwhelming. As the next rooftop came closer to his paws he kicked and failed, ready to be released from this discomfort. High yelps squealed from his maw without thought until finally the psychic was gone and he wa`s standing on his own paws. The sensation faded, but the twinging in his fur lingered longer than he would have liked. Whining like a hound Eleroo spun around before shaking out his soaked pelt. "Shush 'em!" Seek hissed as her graceful landing was ruined with flinging water and grit. 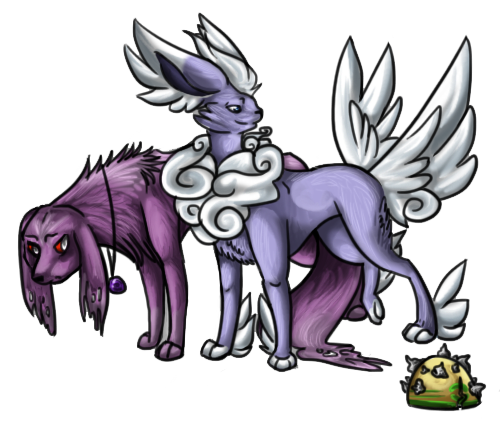 The purple Eeveelution shied away from her, padding away in a huddled clump as he scratched as his itching pelt. "What's the matter with you?" She asked, and though her voice was laced with annoyance she was genuinely confused and somewhat concerned. The male looked at her, uncertainty in his eyes, but he had stopped moving and was awkwardly lifting his paws. Screwing her face Seek stepped closer for an inspection but saw nothing unusual. "What are you-" she started to ask before feeling something odd beneath her paws and hearing, "There is company within." Her ears shot up stiffly, listening intensely for the intruder but were drowned out by the pelting of rain. Again a sort of bump rumbled up from beneath her pads, like something slamming the roof from below. Taking a step back Seek looked around for a quick escape, but realized this roof offered them little more than the last in that regard. "Crap." She hissed, hearing something call from inside as an audible noise could be heard from the access building. "It's in the stairwell," She spoke tensely beneath her breath. Shenron remembered that city. The region Arkana, Shao and the others were from. He wasn't fond of the lights or bustle but... The pastries were to kill for. Honestly he feared what a large city could look like now. While it was relatively hard to maneuver it was also a large city with dark alleys and possibly a sprawling sewer system that could rival Castelia with ease. That sounded terrifying... Shenron turned as Felix addressed Asura next a bit curious as well. His assumption had been Asura was Kantoan or Johtoan like himself. It was rare to run across wild Machamp. Not to mention they were usually extremely aggressive and unapproachable on those rare occasions. Yet Asura was reasonable and honest to a fault. Clearly well trained and mannered. I should've just asked that myself. A reminder that this is indeed the new world, and she should sometime skip the pleasantries of worrying if she's asking too much of somebody. Let them say if it's not doable. She steps up the ledge, shaking off her arm and looking to the other roof, relaxing herself as to not be any more difficult to lift than needed. It was always a strange sensation, being moved or even hit by psychic types. A little unsettling, really, as if she wasn't in control of things at that point. But it came and went easily, her feet resting on another cold concrete roof, a low sigh of relief coming out. She turns to Eleroo, ready to try and console him. "There is company within." She reaches to the blade on her hip, drawing it out and bringing her left leg back- potentially close quarters, and the risk of falling... She's no pokemon, but she's not about to play the defenseless damsel, let alone just watch the others get hurt. Asura lifts his head as Felix seems to reminisce some of the olden days, nodding in some agreement. "Indeed, they have. Though we no longer need the titles like those anymore. We fill the roles we must, and so we survive." It was easier for some than others, even then. Asura was very naturally a fighter, even before the event; his nature by typing aside. "I was raised on a ranch a long while ago. R'hia- The human girl. Her family tended to me as I grew. My master took me in before she had grown much and we travelled. He had many others, and we became brothers and sisters beside him." He leans forward, resting his arms upon his knees. "It is strange to see her now. The unlikliest of people to reunite with, though... it is warming. Perhaps hopeful, in some ways. An end to the horror, hmm...? Honestly, he'd not given that much thought since before this had all become mere commonplace in the world. "I do not know. I dislike guessing upon the future. We are all here now, and we are alive and well. I only wish, that continues until the day where your hopes may come to be, Felix." Things of the past was all swell and all, but Asura had a point on what he said. "Indeed, they have. Though we no longer need the titles like those anymore. We fill the roles we must, and so we survive." Of course it also meant combining both the roles they had from both past and present to increase their effectiveness in fighting. It was very rare for Felix to fight in the past after becoming a psychologist of sorts, but even then making a direct hit on an undead yesterday was mainly a lucky shot. It was why he had to keep himself in shape for when he has to have a more serious fight, he'd be able to protect someone. There was some reflection of the past that Asura then started to talk about. It must feel nice though to see someone again after so long. It made even Felix feel a bit warm, though his trainer is out there somewhere still. "I was raised on a ranch a long while ago. R'hia- The human girl. Her family tended to me as I grew. My master took me in before she had grown much and we travelled. He had many others, and we became brothers and sisters beside him." Guessing after being away for so long it would of been hard, but that wasn't the case. To be best of friends with a trainer would of been simple, but it was much more simple than he thought. "It is strange to see her now. The unlikliest of people to reunite with, though... it is warming. Perhaps hopeful, in some ways." At least he's happy to see her again. That was all that mattered. Another thing though that Asura did have a point on was guessing the future. It would be quite hard to know the outcome of what it holds or if it will come within their lifetime. "I do not know. I dislike guessing upon the future. We are all here now, and we are alive and well. I only wish, that continues until the day where your hopes may come to be, Felix." Focusing on the present was more necessary than the future. Without a present, there is no future. Yet the wish for an end to the nightmare would come, but like so they'll have to fight for it despite the view of it. "Suppose so. A future can't *coughs* exist without a present. First thing though is to get *coughs* me recovered before moving ahead." Felix's illness would need to be cured first and foremost before he was to fight against the undead once again. Once again he felt the need to vomit and he didn't want to do that on the blanket he was being covered with. Instead he swallowed hoping it would stay down at least until he can get one of the two to get him into a restroom to get it out of his system. "Ugh, can you get me into the restroom. *coughs* I don't think I can hold this in much longer." His stomach was queazy and ready to spew out what he had for lunch. In a short few words the sylveon had to describe what he was feeling, Felix had said it out loud. "This is the worst." Never the less he had faith in the others to bring the medicine back. Hopefully they didn't get caught. OoC)) Felix still isn't having a good time. Spreading her paws wide Seek tried to feel for the Pokemon beneath them. The drumming raindrops made for a cacophony of noise and vibrations, making her pads useless and her ears strain to hear the Pokemon rattling below. It called out again, a shrill cry as it made clambering noises within the stairwell and rapidly rose to the rooftop. Rising panic made her eyes lock on the doorway; a dented, mangled metal door with rusted hinges from neglect and weather. It would not hold. Had it heard them, felt them? Was it just reacting to the sound of the rain and mud and trying to get out of its makeshift prison? It's next cry was more like a scream, piercing Seek's eardrums even from within the building with its high-pitched shrill. Her paws trembled and stumbled back a few steps. Whatever it is, it had rattled her. The thought of fighting here, bedraggled, exposed to the elements and other Pokemon, with no where to run and everywhere to fall, made the cold eeveelution feel her bones within her skin. Eleroo whined behind her, clearly frightened as well, but his whimper was nothing compared to the sound of the beast as it reached the top level of stairs and had only a wall separating them. Run. 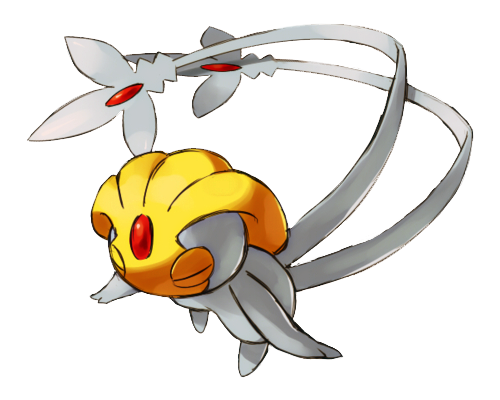 The word echoed in the Aiveon's skull as it hit the door the first time, the rapid, heavy fluttering recognizable to her ears. The second hit was too much, and the heavy impact was enough to both dent and fling the mangled door off its now shattered hinges. It clattered heavily against the rooftop but Seek could barely hear it under the loud shriek of the Staraptor as it circled them. Her eyes went wide like saucers, pupils huge in the dim light of the storm. "Run. RUN!" She wailed before, like a terrified animal, pelting over the far edge of the roof and down its own fire escape. No thoughts, no regards as she stumbled down. Just a singular desire to run. Horror spread across Eleroo's face as he watched Seek abandon them. She didn't stop, didn't hesitate, didn't look back. Heck, she didn't even launch her electric attack! Fear lowered his shaking body to the ground as he watched the screeching Staraptor turn and swoop down toward them. It arched between the kit and human, its leading wingtip barely touching the ground as it curved back toward the sky for a second approach. It shrieked again, the loud call filling the air with noise. "W-we should go-!" Eleroo whimpered, throwing his head toward R'hea and then the far fire escape. With an awkward shuffle of his paws the tod took a few steps in the right direction. They couldn't fight this thing here-- It was making a commotion, and the circling was a painful sign to anyone of them of something being on the roof. Not to ignore the obvious dangers of the situation. "It-it's not safe up here." He begged, hoping the injured girl would be able to scale down the steps. He was weak, a scared child with little combat capability. He couldn't protect her... The bird cawed again, making a tight turn to swoop at them again with a Close Combat. Shenron listened intently but had not much to offer to comfort or confirm their fears. In the beginning he thought it would be the advancement and proficiency humans had in killing things that would see an end to this epidemic. But they ran away. Those who stayed behind were unsuccessful. But at least they tried. At least they remembered this was their world. Their home. What unholy future were they to leave to their hatchlings? It had been so long since Shenron had seen a human child. Would this plague see an end to humankind? Shenron shook his head not wanting to believe that. Wanting to think they'd find a way to come back. He looked at Felix and then at his dragon paws. That was not going to work. If he tried to lift the poor kit his claws would not discriminate. 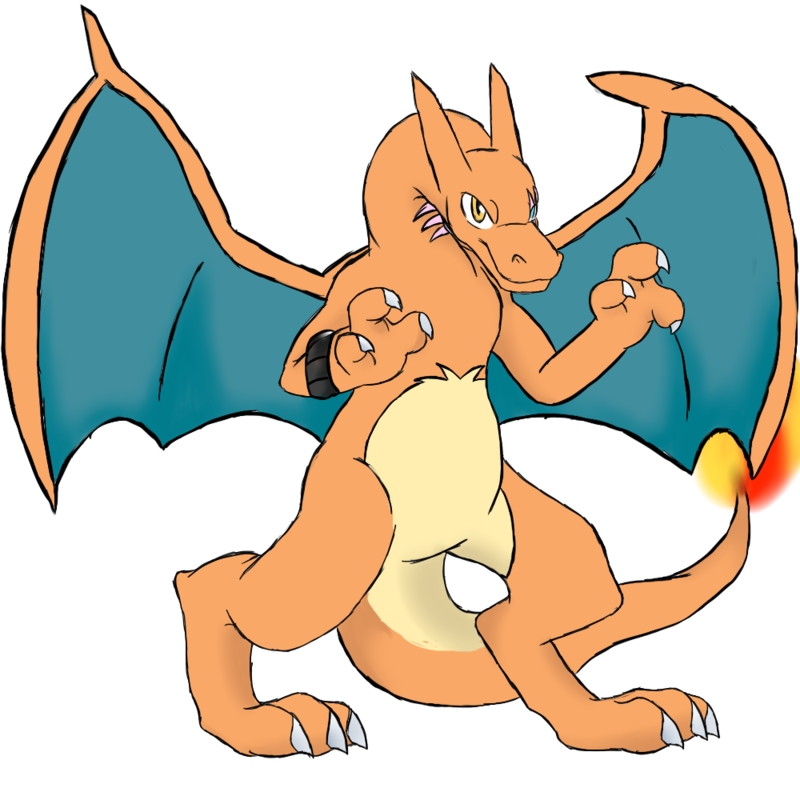 There was a reason most Charizards picked up their children with their mouth. But Felix would probably not appreciate having Shenron's hot, dry mouth on his possibly already overheated little body. Not to mention if he caught the illness himself and his heated body just accelerated it. "I fear my claws would not make for a comfortable journey for you my friend.. Unless you'd like me to bring you a trash bag instead of risking jostling you around and make you feel worse?" The way Felix' face contorted, curled as he felt waves of illness gave Asura at least some hint to try and find something- There were bags strewn about, but most seemed to have holes or otherwise just not be useful. He snags a plastic one from a pile of trash, shaking it off- and letting out a gruff little grunt as he sees it too is ripped. The Machamp uses his lower two hands to gently reach for the Sylveon, Shenron can find a bag. "We should at least get to a different room." To the best of his ability, he takes care to pick up his ailing ally- largely successful, though he stood quickly. His steps were heavy, causing some slight jostling, but he took care not to overdo it as he went through the door, looking about- heading towards a counter. At least there it could be isolated, and he's nary a clue where the bathroom is. Her eyes widen, and as much as she tries to keep her head level, the sight of seek already half-gone over the ledge is enough to make her start to lose her right senses. Her eyes dart around, her head whipping as she looks to Eleroo, to Uxie- While she knew the Legend could tend to himself, she isn't about to outright abandon him. She lets out a frustrated yell as she falls to the side, landing on her hip as the bird cut between them. She lifts herself up, Eleroo pleading her to follow suit to Seek, and flee down the fire escape. This is getting worse by the moment, in her mind, and her lack of options is starting to make the lump rise in her throat. The sound of their nightmare making another swoop, another screech fills her ears. She looks back, the thing barreling down upon them- She'd rather end up bruised than doomed, throwing herself to the side and drawing her longer blade in a wild and desperate slash, intended to at least keep the bird at bay or diverted...!